Do you start with the end in mind? Where should we really start as we dig into sales enablement? The answer, measuring the effectiveness, is normally a task most wait to conduct until the end of the process. Sales Enablement Measurement. Sales enablement can be expensive and time consuming, and management might see it as a distraction for their reps. In fact, according to the CMO Council, 54 percent of senior marketers said they are unsure whether their marketing technology investments are producing tangible business value. So you need to build all sales enablement programs around the concept of justifying the program. How? Start with a benchmark for your organization. Those metrics are pretty straightforward, other than content metrics. 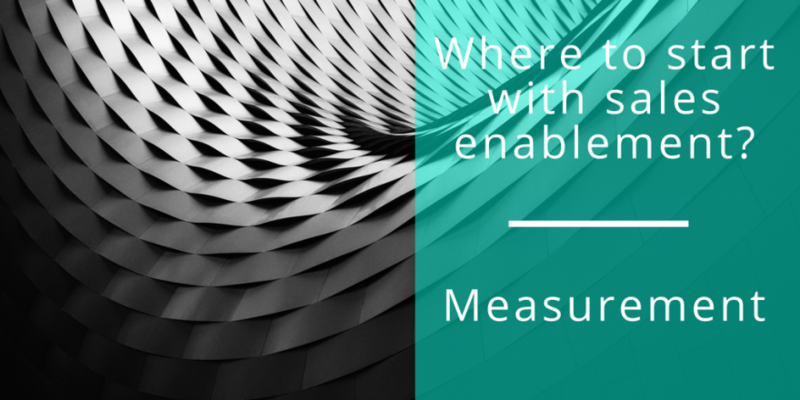 Any content aspect of sales enablement must be designed and selected to provide metrics around consumption, although what data you will get will vary by solution selected. But at a minimum, you will need what content is used and by whom. Since you will starting gathering data before the project launches, I would try to go large in how you slice and dice it. Gather a variety of dimensions like rep, sales management, AVP/SVP, LOB, product line, net new/existing customers, field reps or telesales. Also, check with sales operations, they may have this information already or they may have their own measures of sales effectiveness they would prefer to use. Take a benchmark before – Depending on your CRM system, you might be able to do this at a later date, but it’s important to understand where you are starting, so you can connect the dots. Take a benchmark after – Take the same snapshot after your sales enablement programs have been executed. But give it a while for the program to take effect. Ideally, you would want to do it year after year, to account for seasonal variation but if you have to do six months, then so be it. A/B Comparisons – If you are able to track who attends sales training or uses a sales enablement tool and who doesn’t, you can skip the before and after and go with A/B analysis. Divide up the sample based on usage, sales enablement involvement, and training; then compare the two based on the above metrics. This will be part one of a three part series on measuring sales enablement effectiveness. Next, we will take a look at pitfalls in measuring sales enablement effectiveness.